This October Cammax launched their new ClearView kiosk at Mid Essex Hospital Services NHS Trust as part of a network of kiosks making up a new self-service patient check in system. 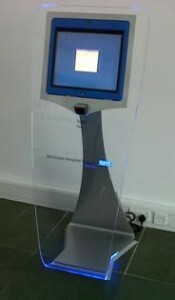 The 8 ClearView kiosks provide more efficient and hassle free way for patients to check in. Patients and visitors accessing the hospital can now use the ClearView to check in for Outpatient appointments by scanning their outpatient’s letters under the barcode scanner incorporated into the kiosk. The aim is to reduce check in and waiting times. The 8 Clear Touch kiosks are complimented by 7 Totem kiosks positioned throughout waiting areas to call patients to their appointment. As an additional feature to resolve patient flow issues within the hospital the unique ClearView are also loaded with a Way Finding application which allows patients to find the location of their appointment therefore allowing appointments to stay on time and not over run due to late attendances.